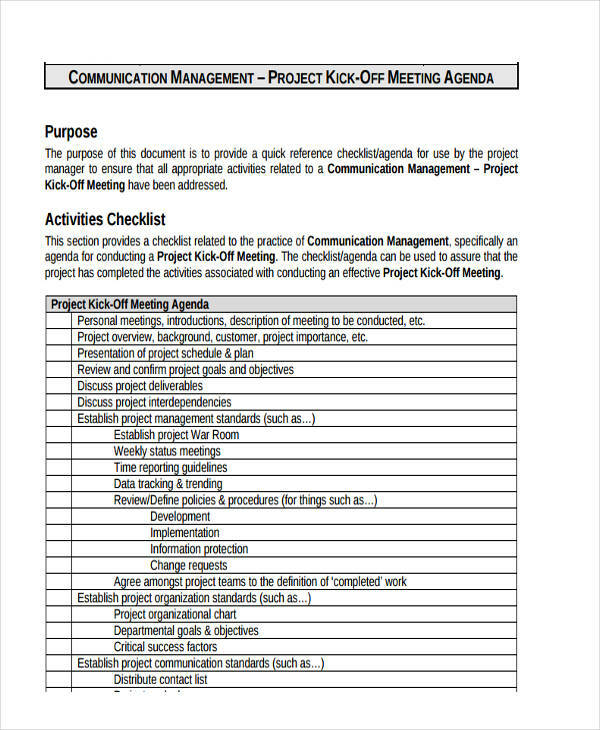 A Project Agenda is a list of things to do in the project that a company needs to be done. It is an outline plan in order for the team to work directly on their designated task. 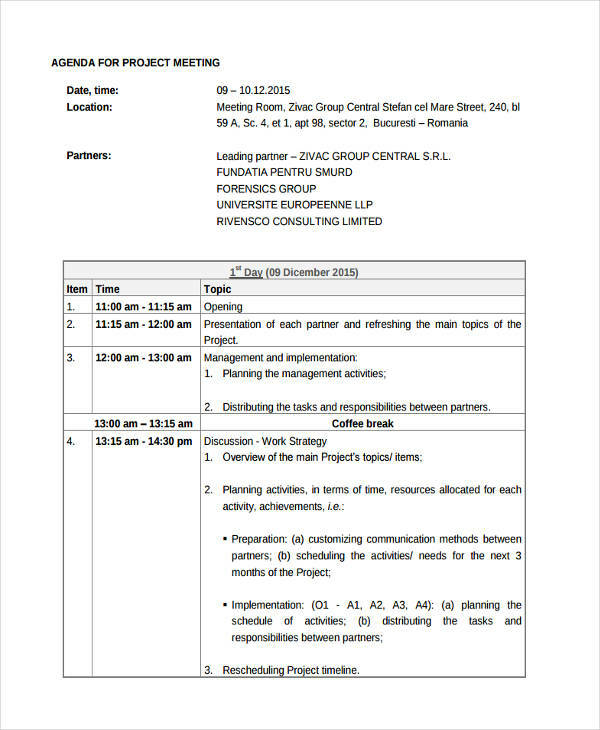 Planning a project is not easy, in order to meet the desired application of the project, effective meeting agenda comes first. 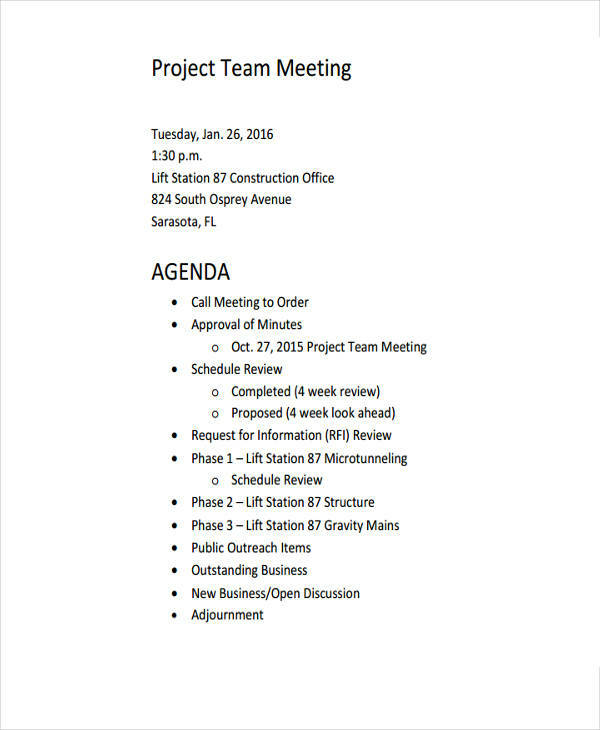 The company must have an effective meeting to plan the project accurately. 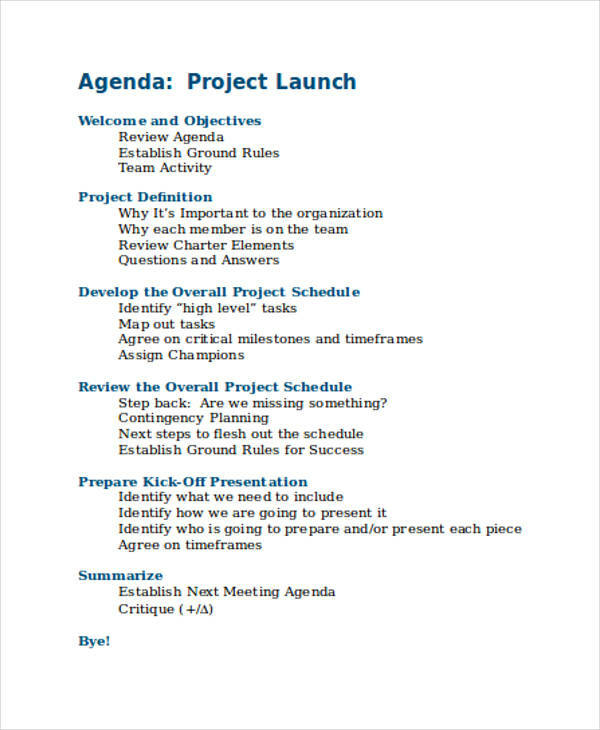 A Project Agenda is an outline of topics or a list of information to be discussed about the project that the company wants to implement. This is where the organization needs in making the project in order to meet the goal. 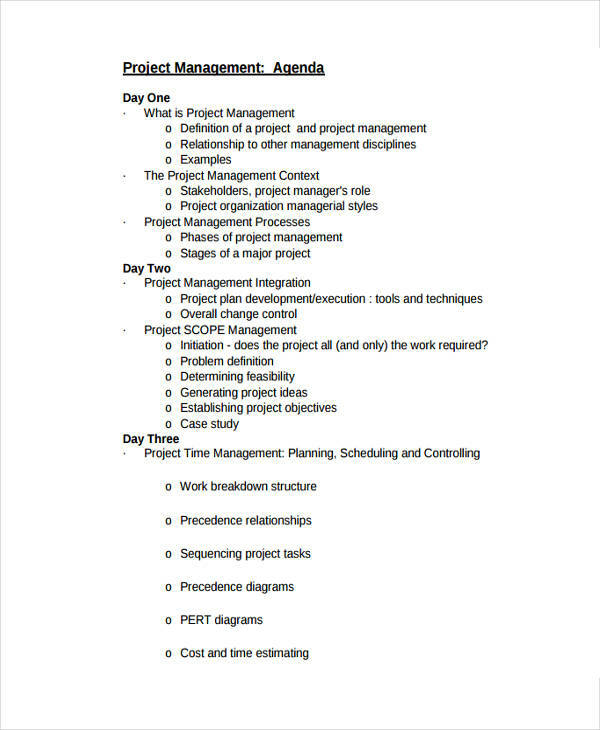 Project Agenda is basically a plan about certain objectives, task, obligation, goals, and so on in order to meet the desired application. See also Agenda Examples in Excel. This is important for the team in making a project in order for them to guide what are their task. It outlines the project plan of the company in order to work with the same goal. It is very effective also in declaring meeting and workshop. 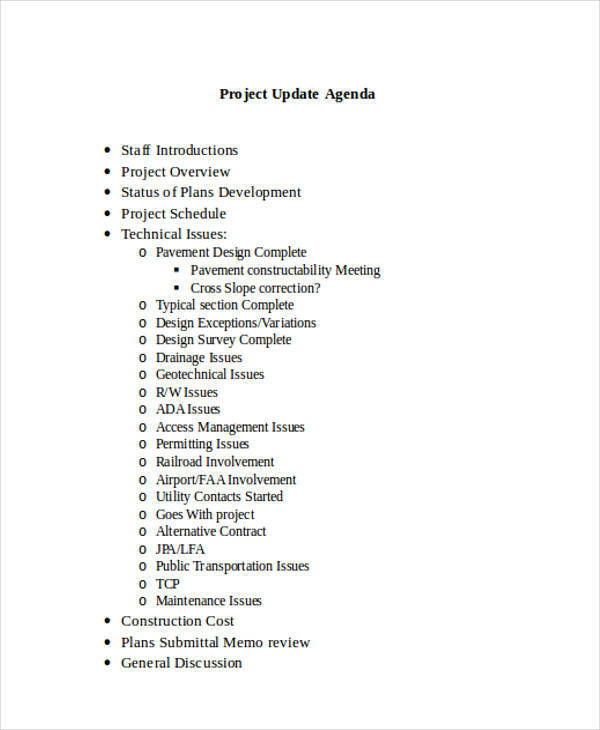 In writing a Project Agenda, you must be aware of the information that you are going to disseminate to the readers. Be specifics in terms of your objectives. You need to consider also that the readers don’t have time to read a full block of text, in that case, outlining the things or topics of your agenda is very important for them to understand immediately about the project agenda. In writing this, you need to set your goal, objective, the purpose of your work plan, your introduction, resources, who are involved in the project, and so on. those are the only few components on how you will write a project agenda. 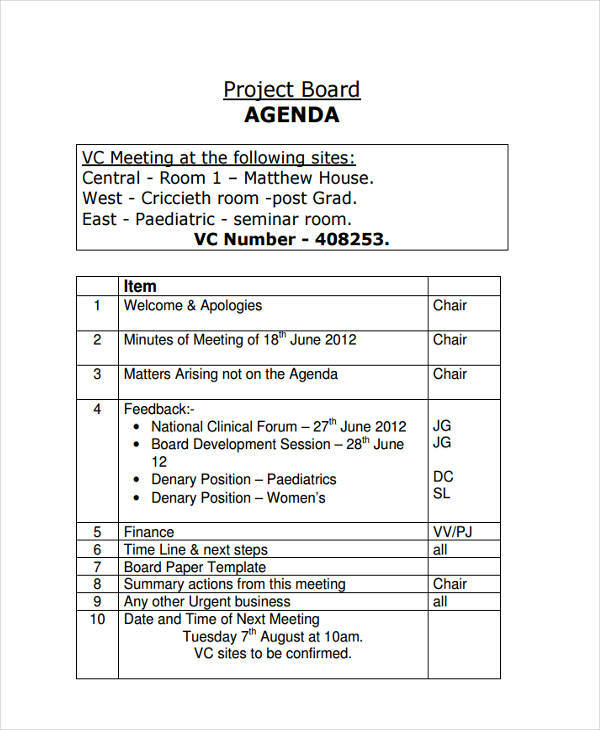 For more examples, please see also meeting agenda examples. In creating status project agenda, you must consider things that are important and helpful in your organization. If you are planning to create a project agenda, you must write and think of it 3 days before the meeting in order to plan exactly the things or topics that should be discussed. The most effective ways in writing this one are; be specific, measurable, achievable, relevant, and time-bound. these are the things to be considered in writing an effective status project agenda. If you miss one of those, I am pretty sure that your project agenda is not effective in any ways. You need to write with more relevant things to discuss in order to avoid wasting of time. 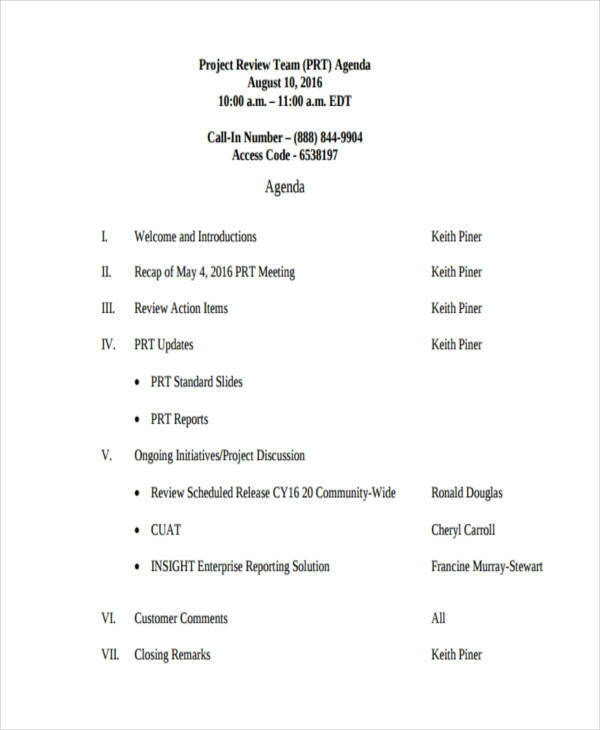 See also our agenda examples in word. Know that you have gone through a lot in our website, we’ll also give you some guidelines in making a project agenda for your references if you are planning too. Introduction. in this document you need to include the introduction so that the readers could identify what would be the expected discussion about the agenda and for that, they can prepare for a comment and suggestions for goods. Objectives. Identify the objective of the agenda, in that way, the company or the people involved would know the things that should be done and needs to be done. An objective is important so that you have guides to meet the desired application. You can also check out our printable agenda examples.